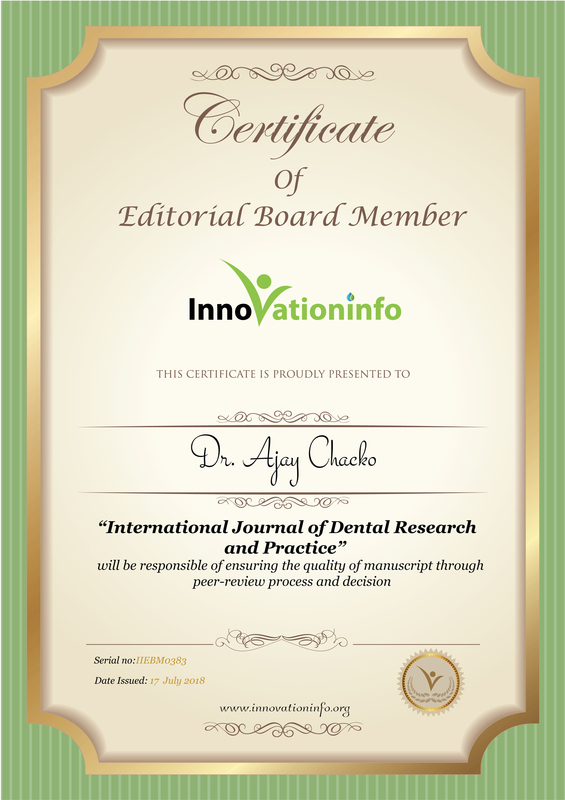 Research Interest: Orthodontics and Dentofacial Orthopedics, Lingual Orthodontics, Clear Aligners for Orthodontic corrections, Dentistry, Dental Science. Biography: He is working as an Consultant Orthodontist for Orthodontic Clear aligners, in Research and Development wing of Renderwise solution Private Limited, New delhi. He is also working as a Visiting Orthodontist at Kaushik dental hospital, Nangloi, and Parichays multispecialty dental and implant centre, Dwarka, New Delhi. He Worked as House Surgeon in Sri Hasanamba Dental College and Hospital from September 2009 to September 2010 He Worked as Lecturer and Resident Dental Surgeon in Sarjung Dental College and Mata R Devi dental Hospital, Darbanga, Bihar from October 2010 to May 2012 He Worked as Resident Dental surgeon at Parichays multispecialty dental and implant center, Dwarka, New Delhi from July 2012 till July 2013 He Worked as Resident Dental Surgeon at Lakshmi Hospital, Ernakulam, Kerala from August 2013 to April 2014. He completed his Bachelors in Dental Surgery from Sri Hasanamba Dental College and Hospital under Rajiv Gandhi University, Bangalore. He completed his Masters in Dental Surgery in Orthodontics and Dentofacial Orthopaedics from Babu Banarasi Das College of Dental Sciences, Lucknow.